The best branding campaigns make brands hipper, cooler, and more engaging. Here are two that try. One works. One bites. Both involve making fun of the brand, which seems to be a new trend. 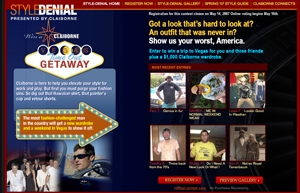 Claiborne’s new Style Denial invites men to share some of the worst outfits lurking around their closets to win a $1,000 wardrobe and a free trip to Vegas (with 3 friends). Nice prize; the branding bites. Then there’s Goulet’s Snooze Bars. It’s campy, it’s goofy, it even links to the zany site of its competitors’ site, Emerald Nuts, which it accuses of messing with the stuff on your desk while you’re sleeping. It’s silly enough that you know that Snooze Bars are meant to be funny. Claiborne, on the other hand, takes itself seriously and manages to put be tired in the process. You won’t even need a Goulet Bar.